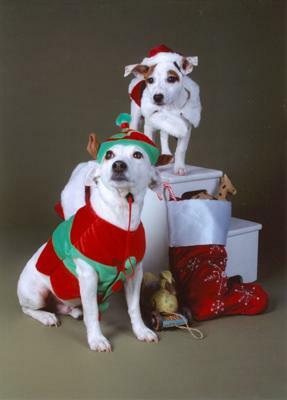 Here is another pic of Jake & Lucy Xmas '08. Lucy is Jake's new buddy. She came to us at the age of 6 weeks. Not usually believing in 'breeders', we thought we'd give it a shot this time because I wanted to raise a JRT the 'right way' from the beginning. We had another we got at 9 mos and as much as we loved and worked w/ our little Petey, he still suffered from so many issues. After losing our Pete on 8/8/08 (he darted in front of a UPS truck) and I just didn't want to go through that kind of trauma, depression and heartache again. But we knew Jake needed a buddy. We kept visiting the animal shelter but just couldn't find that match to fill that void in our home. We found Lucy through a mutual friend and thought we'd give a 'brand new puppy' a chance. Wow. May as well had a baby. LOL. Little Lucy IS a wonderful addition to our family. She's brought so much life and laughter to our home. She loves to go for rides in her doggy stroller, loves to bury every toy and treat under the laundry. And usually comes to ME with her treat to hold for her or rest it on my neck so she can better nibble at it. She loves to 'perch' on our necks in the car, on the sofa, etc. She's so lovable and playful. Sometimes a little too much for Jakey Poo. =)~ But he loves her too! Don't you Jake?! walking out of adoptions w/ a young JRT female. What?!? One of the new gals who worked there 'thought THAT woman was me, the one who had been calling and looking for a JRT' but luckily they had another in the medical unit who had just arrived the day b4! So I brought "Jake" home!